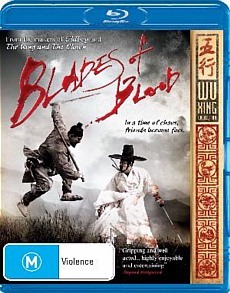 2010 swordplay drama Blades of Blood marks the most recent outing for South Korean director Lee Joon-ik, who came to prominence with his 2003 historical comedy Once Upon a Time in a Battlefield. Returning to the historical milieu but this time around largely dispensing with the laughs, Blades of Blood tells of the threat of Japanese invasion of Korea during the 16th century, and of the political infighting and increasingly large scale rebellions that are tearing the nation asunder. Based on the first-rate graphic novel Like the Moon Escaping From the Clouds, the story revolves around Lee Mong-Hak, a swordsman who raises a rebel army with which he intends to overthrow the present ineffectual government and bolster defences against the imminent Japanese assault. Opposing Mong-Hak is a legendary blind swordsman named Hwang, whose own hordes are also handy with a blade. The two armies must do battle for the crown, and with a title and a premise like this you can be sure plenty of blood is spilled and much epic swordplay abounds. Lee clearly has a great love of history, and of imbuing his dramas with an unimpeachable air of historical accuracy. Once again the costuming and settings are faultless, as is the thoughtful and often quite inventive cinematography. The film is a fairly long one at just under two hours and its plot occasionally meanders, but in the end this is a strong and visually arresting historical drama and one which marks something of a return to form for the highly talented Lee. 5.1 and 7.1 DTS audio on options are on offer, the latter of which will test the mettle of even the most advanced surround home theatre systems, and although the score is somewhat sparse and many sequences are dialogue driven when the soundtrack does kick in there’s an abundance of depth and plenty of directionality too. The film is presented in 1.85:1, not 16:9, and picture quality is also supremely good throughout, with masterful clarity and plenty of rich colourification. No English dub has been provided, though the subtitles are largely comprehensive and error-free. None, the local HD edition is bare bones – not so much as a theatrical trailer in sight.